Product Change Notification - PCN #: CTIU-00004 - Connect Tech Inc.
Hardware Revision ☑ See board number and revision on PCB silkscreen. Other ☑ Revision F and older will have the U.FL connectors installed. On revision G the connectors will not be installed. Previously the Astro Carrier for NVIDIA® Jetson™ TX2 & Jetson™ TX1 installed the U.FL video input connectors. 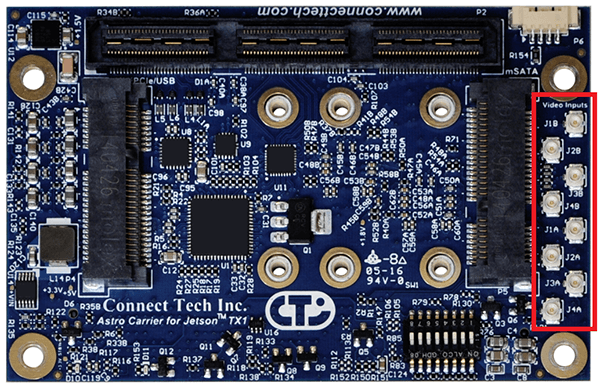 This interface has never been a supported feature by Connect Tech Inc.
Moving forward the Astro Carrier for NVIDIA® Jetson™ TX2 & Jetson™ TX1 will no longer have these components installed on the PCB. 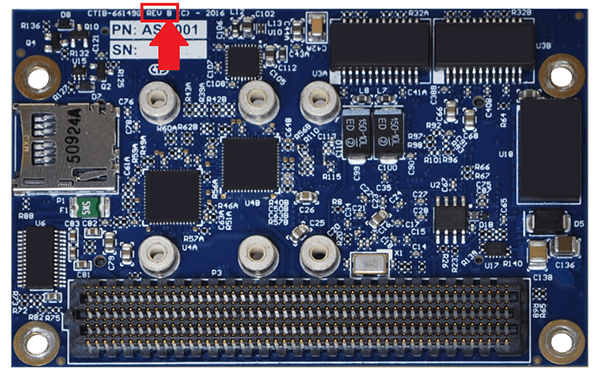 The changes listed in Section 2 will have no effect on the overall quality and reliability of the Connect Tech carrier board. The video input interface has never been supported by Connect Tech Inc. Therefore there are no changes in the supported hardware compatibility of the Astro Carrier for NVIDIA® Jetson™ TX2 & Jetson™ TX1. Mechanical compatibility remains the same as previous revisions. The component placement, PCB dimensions and mounting hole locations of the Astro Carrier for NVIDIA® Jetson™ TX2 & Jetson™ TX1 do not change. After the release of this PCN there will be a transition time of 6 months whereby a delivery may consist of products based on previous revisions as well as new revisions. After the completion of the transition time, only products based on the new revision will be delivered. This does not include products that fall under the RMA process.